There are many reasons why I like having people over to our house. Inviting others into our cozy nest, providing sustenance and relaxation to our friends, the chance to connect with people we care about. I also love the opportunity to make food that we might not eat on a night when it is just the three of us. I know it is best not to attempt a complicated new recipe when you are serving guests and ideally we all want to serve food that we are certain will taste delicious. Fortunately, I don’t feel the need to impress our guests. I aim to provide a really good meal, but I don’t worry about whether I will achieve perfection. When you’re sharing food with good friends there is not a lot of fussing required. It’s the people who don’t mind if your house smells like burnt popcorn, who bring you a bottle opener with the wine, who don’t hesitate to make themselves comfortable on the floor, or at the stove. Absolutely none of this is expected or required but I am happy to welcome people into my home and hope that they feel comfortable here. Over the weekend we were glad to find that our new place has easily enough room for a pack of toddlers and their antics along with their parents and friends. 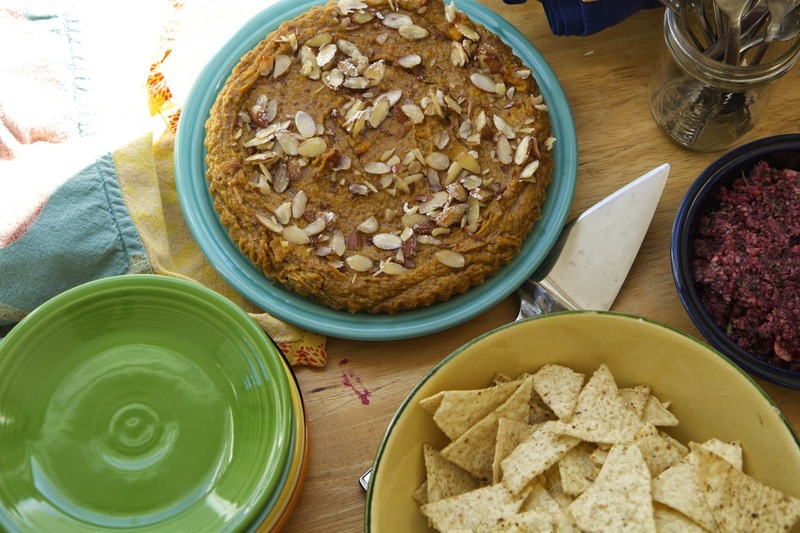 I made some of my fall favorite foods for the gathering, including cranberry salsa, a butternut squash almond pie, the best chocolate chip cookies, and beet hummus. 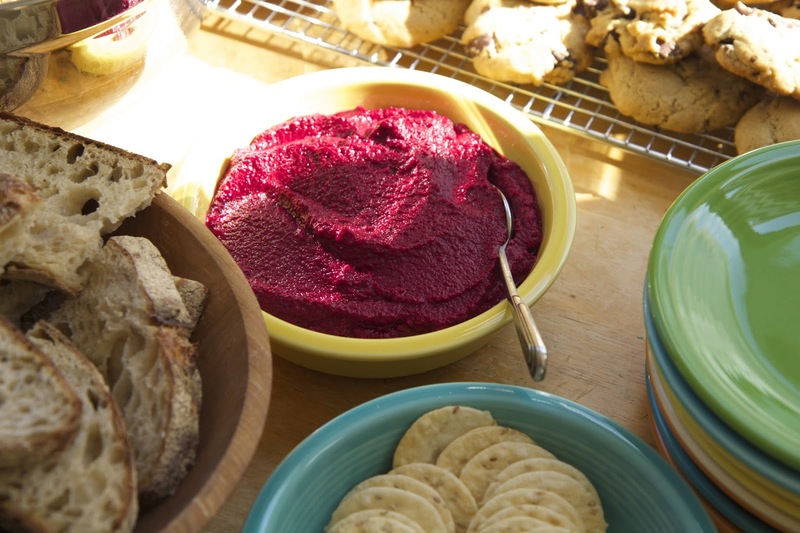 This bright pink spread is excellent on bread or for dipping chips and crackers. The flavors of sweet earthy beets and nutty tahini bring out the best in each other. This recipe should be adjusted to your taste, but here are the basic amounts. If you really don’t like beets, you can substitute 2 cups of cooked butternut squash for the beets which also makes a delicious spread. Place the beets in a pot, cover with water and simmer until they can be easily pierced with a fork. Let them cool until they are not to hot to touch. Slip off the skins (this is sometimes easier under running water). Place the beets, garlic, tahini, lemon juice, salt and cumin in the bowl of a food processor. Puree until smooth. While the food processor is running, drizzle in the olive oil. Adjust ingredients to taste. I too, love the gathering of friends, cooks, and food. Can't wait for Thanksgiving! Jess — you have to try the pie it is basically paleo (I think) and tastes so good. And you don't have to make a crust!